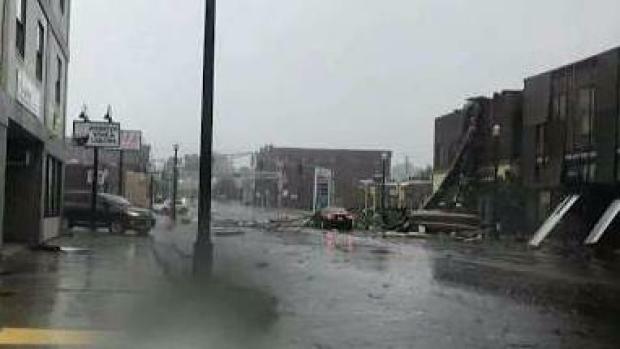 Tornado Strikes Webster and Dudley, Mass. Cassy Arsenault reports from Main Street in Webster, where an EF1 tornado touched down on Saturday. Two tornadoes touched down as powerful storms ripped through New England. 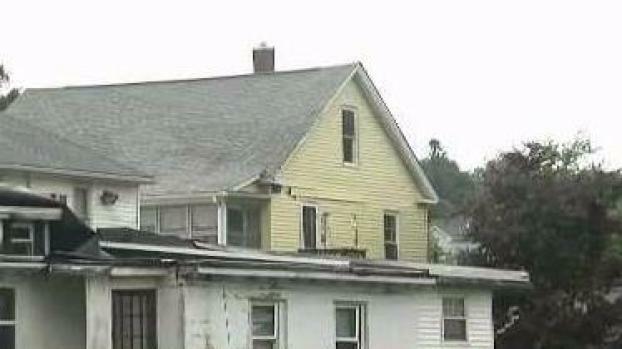 Three buildings were deemed unsafe and had to be demolished in Webster, Massachusetts as a result. Webster fire chief says there was only one minor injury, thankfully. Two tornadoes touched down Saturday in New England, causing extensive damage. An EF-1 from Dudley, Massachusetts to Webster was reported at 110 mph while an EF-0 with winds up to 80 mph was reported in Woodstock, Connecticut. Trees are down and roofs were ripped from buildings, according to multiple reports. The National Weather Service confirmed the tornado early Saturday afternoon but said they are continuing to survey the damage, adding in a tweet that it will "take quite some time" to determine intensity, path and width of the tornado. 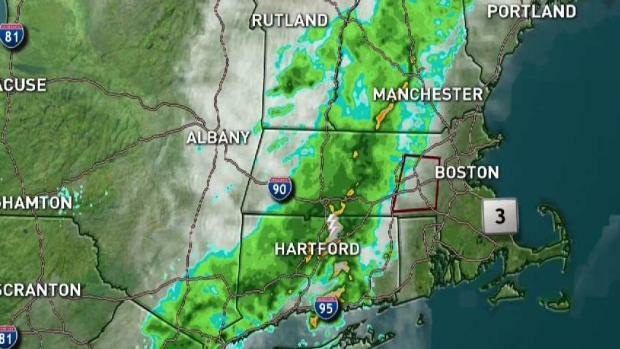 The tornado warnings expired at 10:45 a.m. after being in effect Saturday morning for Worcester and Middlesex counties. The most significant damage appears to be along Main Street in Webster near the Dudley town line, according to a statement from the Massachusetts Emergency Management Agency. Massachusetts Gov. Charlie Baker said in a tweet Saturday that the significant damage in Webster and Dudley displaced both residents and businesses. This morning's tornado has caused significant damage in Webster and Dudley, displacing both residents and businesses. @MassEMA is coordinating the response with local officials, utilities and the @RedCrossMA. Thank you to first responders and others for your quick response. "[Massachusetts Emergency Management Agency] is coordinating the response with local officials, utilities and the [American Red Cross]," Baker's tweet read. "Thank you to first responders and others for your quick response." Main Street at the Webster-Dudley line was shut down due to damage from the tornado. "In Dudley, the main impacted locations include the Schofield Ave, Chase Ave, Central Ave, Cross Street, and West Main Street near the Webster line," Dudley Police Chief Steve Wojnar said in a statement. "There are power outages and numerous roads, including much of Webster’s South Main Street, blocked by debris and trees. Several are Impassable. Non-emergency vehicle and pedestrian traffic are asked to stay out of the area, especially due to downed power lines." The Uxbridge Fire Department confirmed building damage in Webster early Saturday, and images showed part of a roof that was ripped off of a Webster building. MEMA shared there have been reports of significant tree debris in Dudley, but no significant structural damage at this time. In Webster, three buildings were demolished, two commercial and one mixed use that includes several apartments in the upper levels, according to MEMA. An additional four to five buildings have been declared uninhabitable. Webster Fire Chief Brian Hickey said it was necessary to tear down three buildings that were deemed unsafe. The roof of the first brick building was torn completely off and it landed on the second building. It sounded like a train coming through, the woman said of the weather event, which has been confirmed as a tornado. "Everything that's being torn down is being treated as hazardous waste," Hickey said. The fire chief, along with town administrator Doug Willardson, held a 2 p.m. press conference Saturday to provide an update. Hickey said the immediate concern is the safety of residents in the area, and crews will be focusing Saturday evening on restoration of power, telephone poles and getting downed trees out of the area. "We're working to open up the streets and get things back in order," Hickey said. Willardson added, "we'll get this cleaned up as soon as we can." A woman told NBC10 Boston's Mike Manzoni that her business was completely destroyed by a possible tornado in Webster. Hickey said most residents in town had their power back online; more than 880 Worcester and Essex County residents remained without power as of 2:45 p.m., and National Grid remained on scene to resolve the outages. At one point, more than 5,600 people were without power following the tornado Saturday. Webster Deputy Police Chief Michael Shaw told NBC10 Boston there was one minor injury but they are making sure everybody else who was affected by the event has been accounted for and is okay. "It was a woman who was traveling on Main Street and a piece of debris hit her car and caused a minor injury. She was transported to the hospital but believe she is going to be okay," he said. Hickey confirmed that woman has since been treated and released for her minor injuries. Tia Durand-Paradis, of Southbridge, was in downtown Webster for a ribbon cutting ceremony when the severe weather moved through. She described what she witnessed as the storm came through. 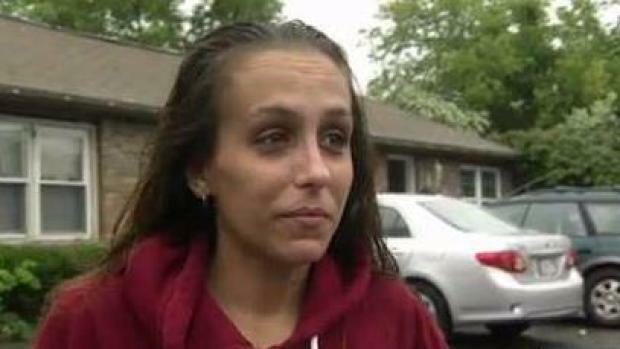 He added she was inside her vehicle, driving down Main Street when the tornado came through. Hickey said when the roof of the first building came off, landing on the second and third building, part of it also landed on her car. Hickey said thankfully there were no other injuries. "Extremely lucky... very fortunate to only have one minor injury," he said. Cleanup crews and utilities on the ground were on scene all morning and afternoon Saturday. "We are running through with MEMA, and we have the Red Cross on scene, obviously the fire department and EMS, everyone is working," Shaw said. The deputy chief, who was in Worcester at the time the tornado touched down, added that the damage is pretty good in size, and that Main Street in Webster took the brunt of the damage. "We've got several buildings that were affected, a couple of them were vacant. We do have some buildings that are contained apartments that unfortunately had to have residents evacuated," Shaw said. "Our building inspector is checking to make sure that those are OK in case they are able to go back into them. If not, we have opened an emergency shelter. But we've got a lot of debris down, telephone poles snapping. From what I'm being told, the majority of the town is without power, so we're taking precautions. We have National Grid on scene, both gas and electric, making sure that we can try to resolve that situation as soon as possible." Hickey said 30 to 50 people are homeless following the tornado. He added the American Red Cross is on scene to assist those people in finding temporary housing. Shaw said everything happened pretty quickly, and while images do show the damage, seeing it in person "doesn't prepare you when it's your community." "We have a very dense downtown with a lot of buildings, and it could have been a lot, lot worse. And fortunately it wasn't." Tia Durand-Paradis, of Southbridge, was in downtown Webster for a ribbon cutting ceremony when the tornado touched down. She described what she witnessed as the storm came through. "The whole sky changed...it was just like sideways rain, and the windows kind of started rattling so everyone kind of made their way downstairs...by total luck the backdoor blew open which I think saved all of the windows from smashing, but the next store over, the costume shop, blew out every window that's in the place, and just a few doors down I guess took the roof right off the building, so it was pretty intense," she said. A tornado warning has expired for Middlesex and Worcester counties in Massachusetts. Durand-Paradis added that they were concerned because the Main Street buildings have all glass fronts. "We were just focused on the glass not coming in at us," she said. "Looking out at it, the only way I can explain it is if you were to stand in an automatic car wash, like it was just torrential downpour, and sideway winds and things just literally blowing by." Durand-Paradis said she has never witnessed anything like it, adding it was pretty scary to experience. Kristen St. Laurent, who owns the Dancer's Sole on Main Street in Webster, told NBC10 Boston they all took cover in the basement. "We grabbed our stuff and ran downstairs and we heard a loud bang and the power went out and it was extremely scary, one of the scariest moments of my life," St. Laurent said. "I was honestly in shock and panic, and I don't even know, I ran, and my safety, and my mom's safety, and my staff's safety, that was my first priority. I didn't care about anything else. I just wanted to get to a safe area and make sure that we were going to be OK. Damage is damage and it can be fixed. You know, people can't be replaced so that's what's important." St. Laurent added her dance studio suffered a lot of damage. "We do have a lot of damage, we do have windows blown out in our front studio, lots of glass, water. Our upstairs studio, part of the roof is missing so we can look up and see the sky which is a little devastating...we definitely have some work to do and repairs to get done," she said. On Pleasant Street in Webster, an electrical pole snapped in half. One woman who has a business down the road from there discussed the devastating damage following the tornado. "It took the whole roof off," the woman said. "We have trees down, everything. It's our business, and it's destroyed. We lost everything over there." The woman said she was at the store when it touched down. "Thank God we weren't here, we probably would have been gone with it," she said. The business woman said she witnessed a lot of damage, including at stores like CVS and gas stations. She added it will take time to rebuild everything. The Auburn Fire Department sent ambulances to Webster for station coverage, as Webster was backed up on multiple calls for both Fire and EMS. The Southbridge Fire Department covered Dudley, as both Dudley and Webster received multiple calls due to the tornado. Willardson thanked all of the emergency responders Saturday and said they appreciate everyone who reached out. "It's been an all around good effort to respond," the town administrator said. The town's senior citizen center was opened for a period Saturday to allow people to cool off. Meteorologists from the National Weather Service conducted damage surveys in Woodstock, over to Dudley and to Webster, according to a second tweet. They made the determination that it was a tornado. NBC10 Boston meteorologist Michael Page says it's all about the trees when surveying damage. He says the direction the trees fall is very telling. If the trees are perpendicular to each other, it would indicate there was rotation touching down. The National Weather Service team moved into Dudley around 2 p.m. Saturday afternoon as it continues to work southwest along the track towards Woodstock, Connecticut. The team will then work back toward Webster and toward Grafton as it continues to do an evaluation of the tornado's strength along the track. Massachusetts Lt. Gov. Karyn Polito surveyed the damage at 3 p.m. Saturday. Chief Hickey said the Department of Environmental Protection was also on scene to investigate the source of a spill into a nearby river. He added that booms and spill pads were placed in the river to try to contain the spill, but officials are not currently sure how much has spilled into the water. It's not immediately clear what kind of spill it is.